Over the years, I’ve lost a few lures and gloves in the field. Simply absentmindedly walked away from them! One time in 1977, I even left my hawking bag out overnight, out in the Spokane Valley. I found it the next day, but the Columbian ground squirrels had chewed a few holes. I don’t blame ’em, and anyway, they were here first. Kinda’ chapped me a little though, since it was an Indian Army surplus gas mask bag, which I bought at an Army/Navy surplus store in Salisbury, Wiltshire in England, while visiting Jack Mavrogordato in the fall of 1967. That’s a story for another day, and the old gas mask bag is retired to display on the history wall out in the shop. Beginning in the mid 1960s, like many other aspiring North American falconers I began making my own gauntlets, hoods, blocks, bow and ring perches, even swivels and bells, because they simply were not readily available from commercial sources. My early hawking buddies and I used modified work gloves and welding gauntlets, but soon I began making gloves myself. Back in those days, there were institutions called libraries. I know some of you might scoff, but you could actually go into a library and they had wooden cabinets filled with small pieces of stiff paper called “cards”. These cardswere imprinted with the titles, authors, and location in the library, for thousands of fiction and nonfiction books covering most of our human experience up to the time! These cabinets were called card catalogs. I found books about making gloves, and lo, they even contained patterns. Best of all, you could sign these books out and take them home and read them! It takes several hours to stitch a gauntlet by hand, but that’s what we did. A lot of folks in game hawking go to some trouble and expense to make or acquire good falconry furniture (falconry furniture is hawking gear; like fishing tackle or horse tack) that meets our needs, enhances our time in the field and improves the safety and welfare of our hunting hawks. It’s a funny thing though, how people will invest in a hawking glove or gauntlet, yet never clean it. Mistreated this way, even high quality gloves will deteriorate beyond use or retrieval in a season. Gloves and gauntlets made from cowhide, which is by far the most common leather in your typical import gloves, get so stiff they’re like a cast. C’mon, some of you know who I’m talking to! Both the moisture and the proteins in the blood and juices from hawk food and from kills will stiffen any leather, but cowhide has the least ability to regain suppleness after the wetting and drying necessary for cleaning. It seems odd to me, since I grew up in a Marine Corps household, but most folks today don’t really know how to polish their shoes, let alone take care of horse tack and other leather goods. It’s actually not hard or overly time consuming, and quality leather items and equipment will last for years, providing much better value if we invest a little periodic maintenance. This kind of care is just a small but important part of life, especially field sport. Take care of your stuff, and it’ll take care of you. Pretty basic, right? Unlike most other suppliers of falconry furniture, we design and manufacture our hawking gloves and gauntlets right here in the Pacific Northwest. We aim for a clean, spare timeless look in our gloves and gauntlets. Comfort, high functionality and durability are our prime criteria. We also try to optimize use of expensive, high quality materials. We make our Pendleton hawking gloves and our range of gauntlets primarily from heavy goatskin, tanned in the United States expressly for Pineo Falconry. Contrary to what you may hear from time to time about the leather industry being dead in America, very high quality leather is still tanned in the United States, in full compliance with state and federal water quality regulations. We use heavy goatskin because it’s very supple like elk and deer, yet much more durable and puncture resistant. Our raw goatskins are also sourced in the US, and our nylon thread is made in North Carolina. Most other falconry furniture suppliers buy their stuff from exporters in Sialkot, Pakistan. We get e-mails from lots of these exporters in Sialkot, offering us gloves and gauntlets at prices which would allow us to mark them up in the range of 300% to 400%, based on prices at other suppliers. Unfortunately, Pakistan is a major center of water pollution and child labor, not to mention everything else you read about the country every day. As it is in China, Pakistan’s huge leather industry is one of the worst polluters of the country’s rivers and other remaining surface waters. Our custom tanned, American goatskin has another important attribute besides being sustainably produced. Goatskin has very high tensile strength, is very puncture resistant, and regains its suppleness after wetting, cleaning and drying. Cervid hides like deerskin and elkskin will also become supple again after wetting and drying, but aren’t as durable as goatskin. 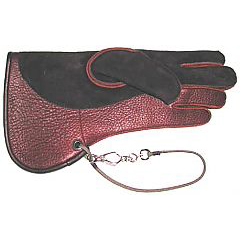 Chrome-tanned cowhide, like the nubuck common in import gloves, progressively stiffens over time. 1) Pull the glove or gauntlet on your hand, and while holding your gloved hand under the cold water tap, give the dirty parts a good scrubbing with a clean, old-fashioned scrub brush. You can use lukewarm water, but avoid hot water. Make sure you hold your hand higher than your elbow, so water doesn’t run down your arm inside the glove or gauntlet. Especially with gauntlets, concentrate the water and the scrubbing on the dirty areas of the thumb, palm and fingers, not the cuff. No sense soaking two layers of leather in a gauntlet cuff as it greatly increases the drying time. Perform this step over a utility sink, like out in your shop, the garage or in the laundry room, if you have one. If you don’t, and you plan to use the kitchen or a bathroom sink or tub, make sure to run this one by your Significant Other! 2) Pull the glove or gauntlet off your hand, roll it up in an old towel from the rag bag, and wring out as much water as you can. C’mon, put your arms into it! 3) Pull the glove or gauntlet back on your hand to reshape it, then carefully pull it off and let it air dry overnight with NO ADDED HEAT. Heat is the enemy of all leathers. Drying outdoors on a dry, breezy day is ideal. The sun’s UV rays will also further sanitize the glove. 4) When it’s dry, you can roll the thumb and finger portion of the glove or gauntlet back and forth in your hands a little bit and it’s returned to its original suppleness. You can repeat this cleaning as often as necessary to keep the glove clean and supple. I find every few weeks works well, but it depends on what kind of food or kills you’re working with, how often your hawk feeds on the fist or on the ground after a kill, and so forth. Here’s another little trick I picked up along the way that greatly reduces the number of wet-scrub-dry cleanings needed during the hawking season: If you wrap some welcome mat style “astroturf” around a foot-long piece of 2”X2” or 2”X4” dimensional lumber, just like common practice for hawk perches, rubbing your gloved hand and thumb with this cleaning tool will work really well to keep the glove or gauntlet clean, reducing the required frequency of wet scrubbing. You can hose off this tool at the car wash or with your garden hose. We get asked from time to time about applying various dressings, treatments, oils or other materials to hawking gloves. I don’t add anything to my gloves after cleaning and drying, though others have used neat’s foot oil, saddle soap, and even mineral oil. Years of experience have taught me that good leather and good care result in a hawking glove which will last for quite a few seasons, with no additional dressings. This way, I don’t worry about any of those dressings getting into hawk food. I usually get at least 4 or 5 years of recreational hawking use out of a glove and frequently more with this occasional cleaning, let’s say every few weeks during the hawking season. While you’re at it, if you’re putting your hawk up for the molt at the end of the season and don’t intend to handle her or him until August, try to remember to store your cleaned glove out of the sun in a cool dry place. If you’ve cleaned it properly it won’t smell bad, so your Significant Other shouldn’t mind if you keep it in your inside equipment room. In a cabinet or on the wall in the garage, out of reach of the dogs is good too. If you leave your glove or gauntlet where the dogs, rats, mice, or even dermestid beetles can get at it, you may well be calling or writing us sooner than you expected! This article first appeared in the Texas Hawking Association’s fall 2012 Journal.